Charges for assault by auto can arise in a variety of scenarios in New Jersey. The fundamental accusation underlying an assault by auto charge is that a person was operating a vehicle in a reckless manner, which results in some level of injury to another person. The statute that pertains to assault by auto, N.J.S.A. 2C:12-C, delineates the degree of these offenses based on the circumstances of the specific case. For example, assault by auto is a disorderly persons offense if the victim suffers non-serious bodily injury. On the other hand, it can be a third degree crime if the driver is driving while intoxicated and the victim sustains significant bodily injury. If you have been charged with assault by auto in New Jersey, a conviction will appear on your criminal record regardless of the degree of the charges. In addition, you may be sentenced to fines and a term in prison. Considering the seriousness of assault by auto, it is essential to aggressively defend yourself. An experienced criminal defense lawyer can provide the edge you need to successfully resolve your case. For a free consultation about your assault by auto case, contact us anytime at 609-832-3202. You can also read more of Mr. Fay’s reviews on Avvo.com. We represent clients throughout South Jersey. 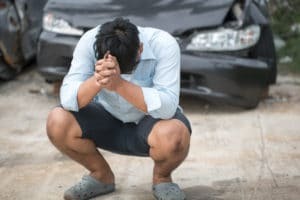 Assault by auto or vessel is a criminal offense in New Jersey that occurs when a driver operates a motor vehicle or vessel recklessly and causes injury to another person. The degree of an assault by auto charge is determined by a number of factors, one of which is the extent of the victim’s injuries. Assault by auto also becomes a more serious offense if the person is driving under the influence of drugs or alcohol, or if the offense occurs in a school zone, at a school crossing, or if minors are in the vicinity at the time. Disorderly Persons Assault by Auto: if a person drives recklessly and the offense results in bodily injury to another person. Under New Jersey law, “bodily injury” means physical pain, illness or any impairment of physical condition. Disorderly persons assault by auto is punishable by up to 6 months in the county jail. Fourth Degree Assault by Auto: if reckless driving causes serious bodily injury to another, or a person is driving while intoxicated and causes bodily injury. “Serious bodily injury” means bodily injury that creates a substantial risk of death or causes serious, permanent disfigurement, or protracted loss or impairment of the function of any bodily member or organ. When assault by auto or vessel is a fourth degree crime, the defendant faces up to 18 months in NJ state prison. Third Degree Assault by Auto: when a person operates a vehicle or vessel under the influence (N.J.S.A. 39:4-50) and causes significant bodily injury. Third degree assault by auto charges are punishable by up to 5 years in New Jersey State Prison. Second Degree Assault by Auto: if a person is driving impaired while on school property, driving through a school crossing, or in the presence of juveniles and bodily injury results. Second degree assault by auto exposes a person to up 10 years of incarceration in state prison. If you or a loved one has been charged with assault by auto in South Jersey, our experienced criminal defense lawyers are dedicated to your defense. We represent clients arrested for assault by auto in Burlington, Camden, and Gloucester counties. If you enlist our help with your case, our number one priority is to devise the most effective defense strategy. We will conduct our own investigation and comb through the evidence to position you for the best possible outcome. Contact us by phone at 609-832-3202 or online for a free consultation with a seasoned criminal defense attorney.